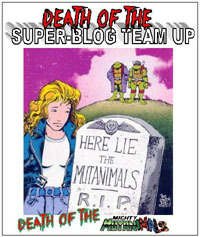 Three issues in, and we get introduced to a villainous team for our Strangers team to face–TNTNT! The art on this issue’s not bad, but doesn’t blow me away. It has the "look" and "feel" of the Strangers for me, and definitely has a ’90s vibe. The story is a bit choppy, and whether it’s lack of story elements (such as a caption denoting time) or the way the art is, I actually thought my reading copy of this issue had been misprinted and that pages were out of order. I eventually caught on to what was being done, but considering I’ve been reading comics for nearly 30 years, I don’t feel I should be so thrown by an issue or unable to catch on FASTER. The story itself isn’t all that bad…this gives us a villain team for the Strangers to fight; obviously if you have a whole team of super-powered heroes, just a lone villain shouldn’t be a match, so having a whole team of super-powered villains works. The way everyone talked in-battle, and the way the TNTNT members introduced themselves felt cheesy as heck to me, and not exactly in a good way. Zip-Zap gets a bit of a subplot, with a bigger range to get away from the battle proper and discovering some suits watching the group; and even gets himself shot/drugged for his trouble. Confusing (and frustratingly so) as the issue could be structurally, I definitely do relish the inclusion of subplots; and whatever complaints I have, there’s a bit of nostalgia in the "old style" of focusing on team members individually in a battle that–were it to happen in real life–would absolutely not be one in which characters could interact as they’re shown here to do. I wasn’t overly thrilled with this issue, but I’m still curious where things go, and looking forward to the Strangers/Hardcase crossover. 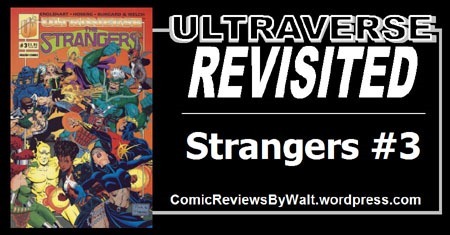 I’m hoping that where I’m not terribly engaged with the Strangers as they’ve been thus far, I’ll enjoy them more once I see them interacting with the Ultraverse world as a whole. 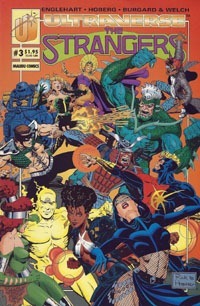 This is only a 3rd issue, and Ultraverse issues not being terribly expensive–period–I would recommend getting issues 1 and 2 along with this, as this would seem more of a mess as an isolated issue. And there’s no real reason to read this in isolation without the first couple issues!